All bookings for interpreters in Queensland Health are managed through the Queensland Health Interpreter Service. The Queensland Government Language Services Policy states that National Accreditation Authority for Interpreter and Translators (NAATI) accredited or recognised professional interpreters should be used and that non-professional interpreters should not be used unless the situation is urgent and a professional interpreter is unavailable. Interpreting sessions in Queensland Health may be conducted in person, over the telephone or via video conference, depending on the situation. 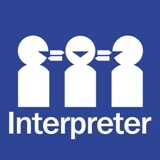 The Queensland Health Interpreter Service encourages interpreters to provide feedback about the use of interpreters in Queensland Health facilities. Queensland Health's progress against achieving actions in Queensland's Multicultural Action Plan. A new report on the perceptions on clients on the quality of the Queensland Health Interpreter Service is now available. The blue interpreter symbol is the nationally recognised interpreter symbol. Click here for more information about this symbol. Do you have concerns about a government or non-government health service or are you unhappy with the way an issue has been handled? Do you think you have been treated unfairly or are you concerned about a decision or action of a health professional?